Last weekend we entertained some parental types in Chicago. It reminded me how you can often forget some of the great activities that exist right under your nose, or in this case, over our heads. The Chicago Architecture Foundation is one of the best resources for learning about both the built environment and the history of our city. They offer many different types of tours: walking, bus and boat, in addition to special events and programs. Foundation docents are local volunteers with a passion for architecture, some are even architects or architecture students themselves. We were lucky enough to have a private tour with just our group of four assigned to one guide. 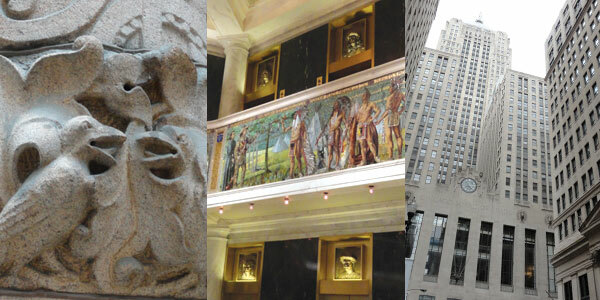 Our particular tour (Historic Downtown South) began at the foundation’s headquarters in the Santa Fe building on Michigan Avenue. It covered the southern Loop area and focused on the Neoclassic to Art Deco in the course of two hours. We got to see the lobbies of building we’d walked past, but had never seen inside. At the Marquette building at Dearborn and Adams, the facade is nice enough, but behind it is a gorgeous lobby with Tiffany glass mosaics, marble walls and elevator doors with bronze reliefs above honoring members of the Marquette and Joliet exploration party. At the art deco Bank of America building on South LaSalle, the original lobby arcade is still intact, with white marble walls and ornate, art deco stainless steel detailing. We also stopped by the Rookey, Monadnock Building, Art Institute of Chicago and Auditorium Building and also took a look at how the postmodern Harold Washington Library references surrounding structures and styles. Other walking tours cover different areas of the city and different time periods, allowing guests to select a tour to appeal to their preferred interests. Having previously taken a boat tour, I can say the walking tour gives a much more in-depth experience as you can see and touch architectural details rather than just pass by and observe a building from a distance. If you need a quick getaway without going anywhere, always remember there are plenty of options right in your own backyard. Nothing screams “tourist” like walking around the Loop with a guide and an earpiece, but it was worth sacrificing a bit of local cred for the educational value. Rookery Building details, Marquette Building lobby with mosaics, Chicago Board of Trade. This entry was posted in Travel Tips and tagged Architecture Tour, Chicago, Chicago Architecture Foundation, Chicago Walking Tours. Bookmark the permalink.